Developed by us, sold by our sister company Gel Services, Inc.
Now you can export gelstrings to our latest app: ShadowMagic. Gel Swatch Library has been updated to the modern age. Apple's iOS operating system has been improved since iOS 1.0 when we first made the library in 2008. Now the new phones have P3 wide color gamut displays, much faster processors, and more display area. We have taken advantage of all of that to bring you a version for modern day usage. Best of all with our new foundation, compatible with iOS 11, we have new features and tools planned to make your job much easier. All the new phones have wide color gamut. This allows much better and more vibrant colors, particularly in the reds. 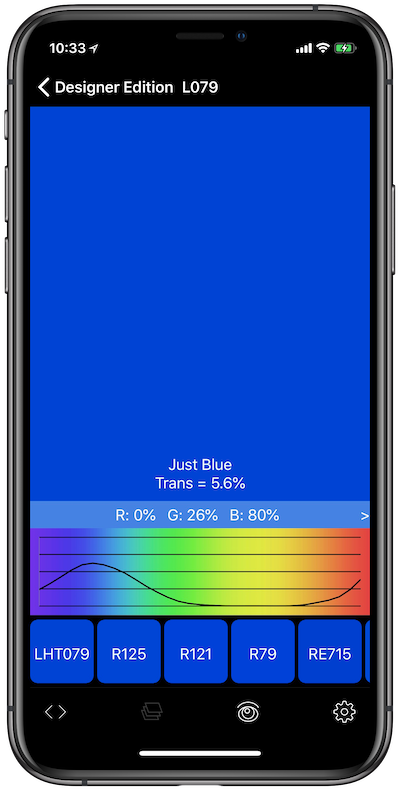 But for you to see the difference, we had to change our algorithms to show off the great new color range. The screen shots above both came from an iPhone 7 and the difference is startling. Notice that the old program's color representation is dull compared to the new colors you can see with wide color gamut. Wait til you see it on your phone. See more at Gel Services, Inc.
Gel Swatch Library is still sold through Gel Services, our sister company. Take a look at their website for more info and pretty pictures. All of the popular gel brands are in this library. Search and compare across the entire library. View similar and complementary colors. Combine gels and view them on different light sources.